Small town bad boy Dean Everett has made good in the tech world and now struggling Hayden, Georgia, is ready to welcome him home—along with his corporate headquarters. But Carmen Stiles is less than happy to see him. Dean had no idea he broke her heart when he left town after high school. Now he plans to make up for it—and as old friendship stirs new passion, Carmen just might let him—until she suspects he has no intention of really making things right for Hayden, or for her…. Benjamin Brooks’s marriage ended when he learned his wife was having an affair—with his boss. Now he’s returned to Trinity Falls to start a new job—and ignore Christmas. Too bad his new employee, June Cale, won’t let him. 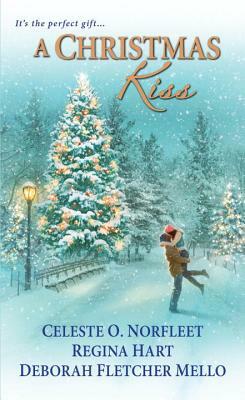 June knows all about bitterness, and she’s determined to help Ben heal—through embracing the holidays. And soon he just might find himself embracing brave and beautiful June as well…. her husband and two teenager. Visit her online at celesteonorfleet.com. Regina Hart’s small-town romances take place in the fictitious community of Trinity Falls, Ohio. Growing up in New York, Regina's neighborhood reminded her of a small town, where everyone knew each other and watched out for the neighborhood kids. Regina now lives in Ohio with her husband. Regina loves barbecues, sports—college as well as pro—and hiking with her husband. Learn more about Regina on her website AuthorReginaHart.com. Writing since she was thirteen-years-old, Deborah Fletcher Mello can’t imagine herself doing anything else. Her first romance novel earned her a 2004 Romance Slam Jam nomination for Best New Author. In 2005, she received Book of the Year and Favorite Heroine nominations, and won a<I> Romantic Times </I>Reviewer’s Choice Award in 2009. Born and raised in Connecticut, Deborah now maintains base camp in North Carolina, but considers home to be wherever the moment moves her. Feel free to reach Deborah on deborahmello.blogspot.com, or on Twitter @DebbMelloWrites.